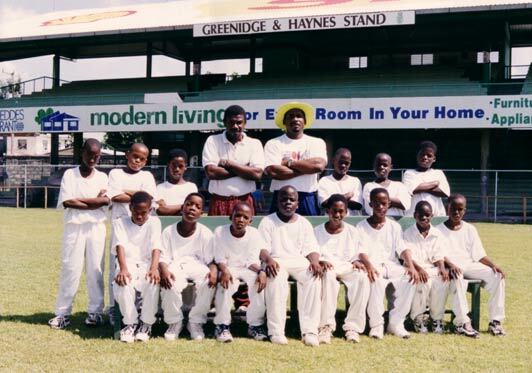 Gordon Greenidge Primary School, St Peter, Barbados. How many of us often wish we had the ability to bring an extra valued dimension into the lives of young people. Four years ago I was given the wonderful honour of having a Primary School named after me and as part of my ongoing commitment to young people in Barbados I have tried to involve myself in as many regular visits to the school as my diary will permit. The school has a commitment to achieving each child's full potential and works tirelessly towards that aim. I hope that I bring something of that self-belief with me every time I visit as I really enjoy giving talks to the children and it is a delight to hear their questions and inquiries. Like most schools throughout the Caribbean, there is a thirst for knowledge at the Gordon Greenidge Primary School which often outstrips its' expenditure. We aim to raise funds within the school annually but as we are all aware equipment and books are very expensive. I would very much like to set up links with schools and individuals out side Barbados who may be able to donate Books, sports equipment, computers etc. We have some excellent prospects both academically and in sports and we want to encourage our children to become part of the ever-expanding world outside our beautiful island. If any schools would be interested in setting up pen friendships or to get involved with our school please don't hesitate to contact me, I will be delighted to respond. Site by EVISUAL Group | © 2019 Copyright Gordon Greenidge.